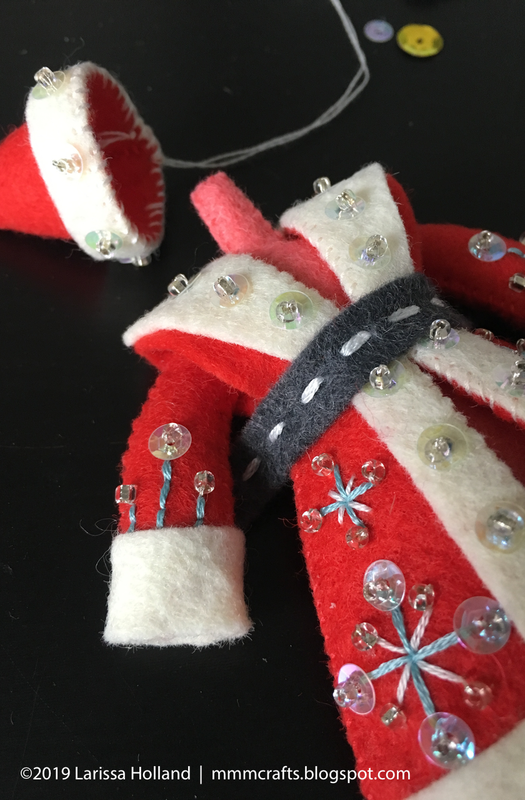 Two WIP photos of a future pattern for a Santa Claus ornament. Last year a sweet customer of mine contacted me to ask for a pattern for Santa Claus, and at the time it wasn't possible to do more than just suggest ways for her to modify the Piper or Drummer pattern to be a Santa Claus (also Maid makes a nice Mrs Claus with some mods). After pondering other things the I could change and add, I got pretty excited and curious to try my own version and maybe develop a pattern. I started it last year but had to set it aside and recently picked it back up. Here we go. 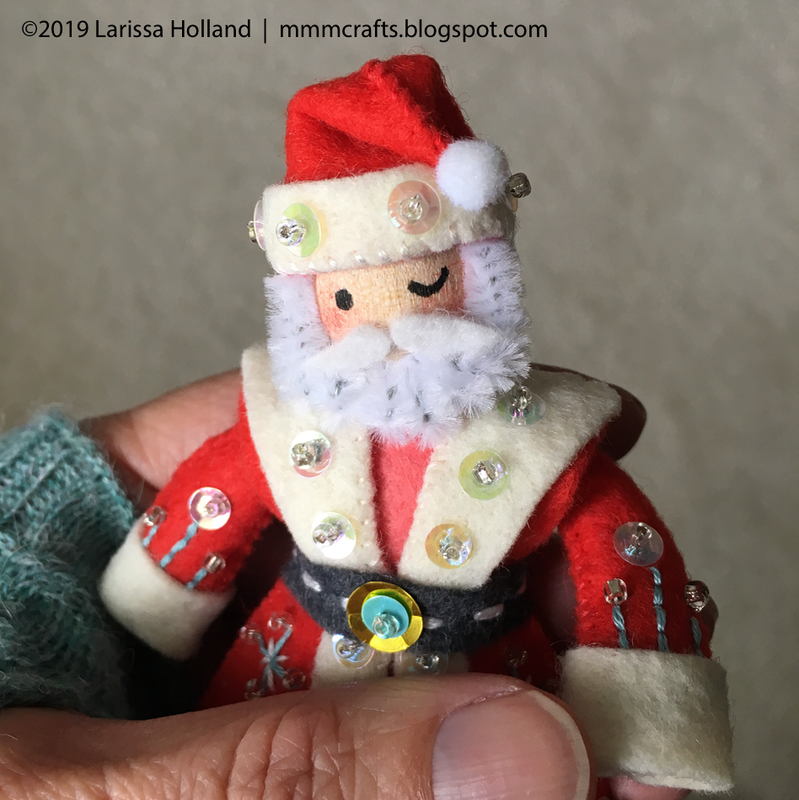 I really love this little bearded guy, and I'm thinking of maybe doing a short pattern series of North Pole residents. If you've made the Twelve Days series, you can definitely make this Santa. Which I will be developing alongside another series I'm designing inspired by Charles Dickens' A Christmas Carol. The plan is to release each one as it's done. I have so many ideas and so little time! It's my constant dilemma. I LOVE this. Yes, please, to the North Pole series and the Dickens series! I love him. Will he be available as a stand alone pattern or only as a part of a club series? Hello, pudgypooh, I release them as single patterns as I go and then offer the series at a discount as a bundle. Thank you! I can't wait to see him! Gorgeous. I just love the idea of a North Pole series and A Christmas Carol series. WOW I love this guy. Larissa, you are always inspiring. You are always so encouraging! Thanks, Rosemary! I can not wait!!! I make 24 (yes you read that right) to give as gifts to family each year. I am starting Colly Birds this year and should be able to do Gold Ring to. (Keeps me busy at night so I dont snack LOL) Now when I am done with 12 Days I will have something to move on to. Keep up the good work. They are all so lovely!! Wow, Shannon! 24! You are a rockstar! I am an unrepentant night snacker, so I need to keep my hands busy too. Thanks a bunch! I'm not big on Santa Claus-I prefer cardinals and woodland themes but I would make Mr and Mrs to go with the 12 days. Sure, Natureluvr57! I love a good woodland theme. a christmas carol???!!!! i'm swooning. please don't forget mr. fezziwig, whose calves gleamed as he danced the sir roger de coverly. he is practically my favorite guy in dickens. i am so excited about this i could scream. THANK YOU!!!!! Haha! I’m so happy you like the idea! Yay! Fezziwig would be such a fun ornament.